Bay Aging, through its Bay Transit Division provides thousands of rides a year throughout the Northern Neck, Middle Peninsula and beyond. The majority of its passengers are picked up and delivered to their homes in rural parts of the region 12 hours a day, 5 days a week. As you can imagine, the word “rural” is a key component of the environment in which passenger’s live and the Bay Transit buses must reach each and every one. To do this, many homeowners have residences that are easy to get to and others, well, not so much. This past winter was filled with ice, snow, lots of rain and it all led to driveways that were muddy, slippery and dangerous. To keep the passengers, Drivers and buses safe, Drivers must be very aware at all times of road and driveway hazards such as those this winter. To keep Drivers aware, there was an awareness campaign this past winter that, to this date was successful. Driving safely was stressed in the Quarterly Safety Meetings and large posters showing buses stuck in the mud but the most effective warning was notifying Drivers several times a day to be aware of their surroundings. Each bus has an electronic tablet that is used for the driving schedule and Transit Dispatchers in the office are able to send safety messages throughout the day that show up on the tablet reminding Drivers to always be careful and to be safe. This technology is effective, efficient and timely and can be spread throughout the whole service area with a single key stroke! 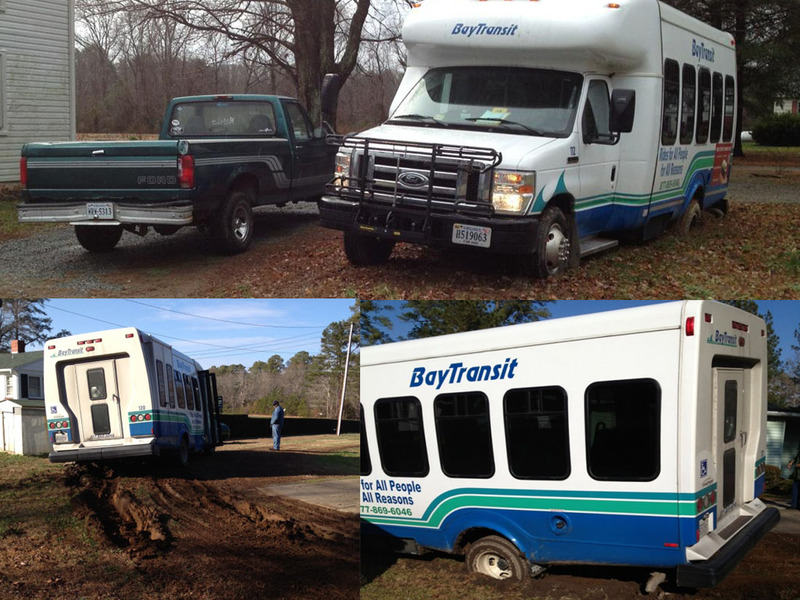 Each year Bay Transit strives to provide the best and safest transportation in the region through professional Drivers, equipment and technology.